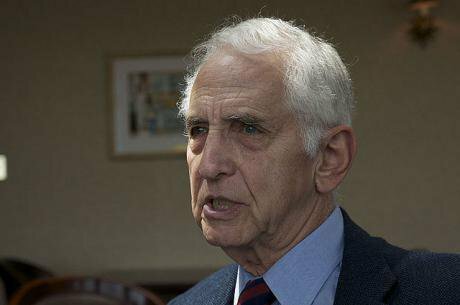 Daniel Ellsberg, whistleblower and peace activist. Wikicommons/Christopher Michel. Some rights reserved. After long and hard negotiations to form a new government following the September elections, it now seems that we will get a continued Social Democratic/Green government supported by the Left Party and, more importantly, now also supported by Liberal and Center parties which broke away from their former coalition with the Moderate/ Conservatives and Christian Democrats (in what was called the ‘Alliance’). It has taken all this to isolate the xenophobe Swedish Democrats (who got 17 % of the votes) which with some success flirted both with the Conservatives and the Christian Democrats. This means that compromises were made on both sides, mainly by the parties in government together with the Liberals and the Center party. If this is confirmed – probably at the latest on Monday, after intense internal party meetings over this weekend, it will be the first time in recent European history that, what we can call "the politically decent centre" has taken up a fight with the xenophobes rather than including them in some kind of cooperation. We have seen the negative effects of the latter strategy in Denmark, Finland and Norway among others. So, we keep our fingers crossed and wait for the final outcome Sunday or Monday. In particular, because the fateful issue in Sweden’s autumn election was nuclear weapons. Last summer, just before the election fever started to rise, an old friend of mine told me he had made a decisive decision. Based on his own dramatic life experiences and as a likely last-time voter, he had asked his children and grandchildren how he should vote. It was their future that was at stake, not his. Suddenly the election campaign took on a deeper meaning for me. My mind flew back to another fateful election, in the early 1960s, when the issue of a Swedish nuclear weapon was under consideration. In favour of the bomb at the time were the Conservative Party and Commander-in-Chief Torsten Rapp. Social democracy was cautious, while a broad public opinion mobilized against. In the end, Prime Minister Tage Erlander, a Social Democrat, realized that possession of a nuclear bomb would make Sweden a target and drastically reduce our security. On August 6 this year, the world commemorates the memory of the 212,000 men, women and children who died when American nuclear bombs were released over Hiroshima and Nagasaki. Even today, hospitals in Hiroshima treat radiation-damaged people and find new diseases in survivors and their children. And the nuclear powers are now investing in more "efficient" atomic bombs. Today, there are nearly 15,000 nuclear warheads. Of these, 1,800 stand ready to be fired. Their explosive strength equals 50,000 Hiroshima bombs. The scientists behind the Domesday clock, which is updated according to how close the planet is to a nuclear war, had issued a warning. Only at one earlier time had the clock been closer to midnight – in 1953 when both the United States and the then Soviet Union tested nuclear weapons. When we went to vote in September last year, the atomic bomb was once again at stake, with the threat of a dramatic shift in security policy. A shift that would have severely limited our foreign policy freedom of action, increased Sweden's insecurity and, moreover, opposed a strongly-held public opinion. This was about Sweden's role in the fight against the new nuclear arms race and about membership of NATO, issues that are organically intertwined. Initially, these fateful issues received little space in the election debate, despite the fact that one never-ending story in bourgeois and military circles is the unlikely threat of a unilateral Russian invasion of Gotland, that has to be addressed, it is argued, with the help of US marines and the super-expensive, failed American Patriot missile system. But the system change was to be sneaked in, under the citizens' radar. The party headquarters involved had all seen the people's verdict : a devastating majority had supported the government's declaration of their intention to vote for the UN Convention on the abolition of nuclear arms. According to the opinion institute Sifo in October 2017, almost nine out of ten Swedes were in favour. Resistance to NATO was also clear: 44 per cent said in January 2018 no to membership, an increase of 4 per cent since 2017, 31 per cent yes. But with their no to the UN Convention and yes to NATO, the bourgeois parties in the Alliance ignoring this, pulled the atomic bomb into the election campaign. In a Moderate party motion to the Riksdag, "Security Policy for Sweden", they insisted that Sweden must create a road map for NATO membership and that Sweden's defense expenditure should increase, approaching the 2 per cent of GDP that was NATO's goal. It is no wonder that Trump insists that NATO should contribute more. The US military budget is 3.5 percent of GDP, that is, $ 600 billion, which is 10 times more than Russia's. But the 2 percent is not just for being able to operate in Europe, it is also money that enables the United States to conduct unbridled wars, assisting Saudi Arabia and Israel militarily, and maintaining nearly 100 military bases across the globe. Why in the world should Sweden participate in this? Our one-percent peace-promoting and conflict-prevention civilian assistance is far more effective than NATO's two percent military upgrading. The motion protested against the government's intention to ratify the UN Convention as "something that risks jeopardizing Sweden's defense policy cooperation". The same language was deployed by the rest of the Alliance. What had happened to Torbjörn Fälldin's and Karin Söders Center party, once a staunch defender of our military non-alignment? In 2010, Annie Lööf motioned that "the Swedish government together with our Nordic neighbors should work to make the Nordic region a nuclear-free zone". Same thing in the Nordic Council 2011. But now she was the leader of the Center Party and had joined the conservatives in not wanting to sign the UN treaty. In other words, the Swedish bourgeoisie had given up decades of Swedish struggle for a nuclear-free world, accepting NATO's nuclear weapon doctrine and the Pentagon's illusory nuclear umbrella. What can an umbrella achieve against the annihilating rays of death? Was the future security and independence of Sweden now to be deposited in the hands of the Pentagon? Sweden has long argued that unless the nuclear weapon states live up to their obligations of mutual disarmament, other states are encouraged to acquire the same weapons. Unfortunately, this is what has happened. From the original five nuclear states, we now have nine, which, in the words of Olof Palme, hold the rest of the world hostage. For these reasons, Olof Palme and Ingvar Carlsson, both Social Democratic prime ministers, pushed the demand for a nuclear-free zone in the Nordic region. They wanted to see an "unrestricted nuclear-free zone" in and around the Baltic Sea, as a process and a way to reduce the militarization in our part of the world." The "increased tension" in the Baltic Sea, which is so often used as a reason for NATO membership, gives the zone idea a new topicality. "Unrealistic", claim the Nato proponents. But what is the breathtaking crisis triggered by North Korea and the United States about? Well, about a nuclear-free zone on the Korean Peninsula! The eight nuclear-free zones set up so far include 120 states plus 18 other territories and just over half of all the land of the earth. They represent a tangible evidence of the will of the global majority. We are embarking on a collective suicide if we hand over the responsibility of working for a nuclear weapons community to Donald Trump, Kim Jong Un, Vladimir Putin, Benjamin Netanyahu and the other five nuclear weapons holders. Take for example, the idiocy of providing smaller and “more accurate” nuclear weapons which we hear coming from both the Kremlin and the White House, without apparently taking into account all the evidence that this leads – falsely – to a perception that nuclear weapons can be treated like “ordinary” weapons, unlike the sui generis monstrosities which they are. We cannot build lasting welfare under a nationalist glass lampshade. Inner peace is connected to the peace outside. So how would I vote? At the time, I felt strongly that Sweden’s election process was part of a much larger context. It had not been Olof Palme who had brought me into politics: it was the atomic bomb. But it was Palme who had shown the way, with courage and concrete initiatives. Prime Minister Stefan Löfven had explained earlier in 2018 how "nuclear weapons are the single biggest threat to our common survival". Foreign Minister Margot Wallström followed up in that year´s foreign debate in Parliament: "The risk that nuclear weapons can actually be used is currently judged to be greater than in a very long time. Passivity is not an option". At the same time, the Government's message was obscured by the one-man commission on the pros and cons for ratifying the UN treaty that was due to report back after the election. Was it reasonable to put the political solution to such a fateful decision into the hands of one solitary diplomat? The first vote of my lifetime had been driven by political passion. My choice this time was burdened by angst, but also by the realization that the most effective way to prevent a nuclear apocalypse is to abolish these doomsday weapons. I thought of the Swedish poet Harry Martinson's despairing warning in his space poem Aniara (1956): that man on earth risked "becoming his own executioner", from whom "God and Satan, hand in hand" would flee. The choice was then for me above all a position for military non-alignment and a nuclear-free world, against all nuclear weapons, its alliances and its defenders. We cannot, after all, flee the atom bomb in the election booth! The annual Olof Palme Prize is awarded for an outstanding achievement in the spirit of Olof Palme, chosen by the Fund’s Board, chaired by Pierre Schori. The Prize is 100,000 US dollars. “for his profound humanism and exceptional moral courage”. Motivation: When Daniel Ellsberg, a former military analyst and the world’s most important whistleblower, exposed the U.S. Government’s secret plans for Vietnam in 1971, he was well aware of risking a long time in prison and a spoiled career. Regardless of such consequences, his decision led to the removal of a mendacious government, a shortening of an illegal war, and an untold number of saved lives. The 2018 Olof Palme Prize goes to Daniel Ellsberg for his profound humanism and exceptional moral courage.